Editor's note: For most families, the Generation Guard Clinical Digital Thermometer is the only one you'll ever need, but parents of infants will appreciate the simple Vicks V934 rectal thermometer. Our top choices in ear and forehead thermometers -- from Braun and Exergen, respectively -- are still great choices, while the Kinsa Smart Stick remains a favorite of mobile tech lovers. The Generation Guard Clinical Digital Thermometer is everything a basic digital thermometer should be: It returns results quickly in about 15 seconds, it can be used orally, under the arm or for a rectal reading, and it's fully waterproof so you can wash the whole thing if need be. The Generation Guard thermometer is accurate to 0.2 Fahrenheit or 0.1 Celsius, and switches easily between the two units of measure. The Kinsa Smart Thermometer pairs with your iOS or Android smartphone, harnessing its processing power to take quick, accurate readings. Because your phone does most of the work, the thermometer itself is small, light and durable. It plugs into your mobile device's headphone jack and includes a free app that walks you through positioning the thermometer correctly, lets you add written or photo notes, and tracks your symptoms, temperature and any medication you take. 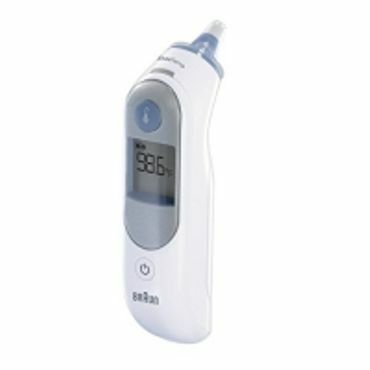 The Braun Thermoscan 5 IRT6020 ear thermometer tops the charts thanks to its speed -- readings are returned almost instantly -- and suite of features. A soft, pre-warmed tip helps eliminate the discomfort and inconsistent readings that can result from a cooler tip, and a light-and-beep system helps you position the thermometer correctly. Users love that it uses AA batteries, and an upgraded version is available that includes a color-coded display to indicate fever. 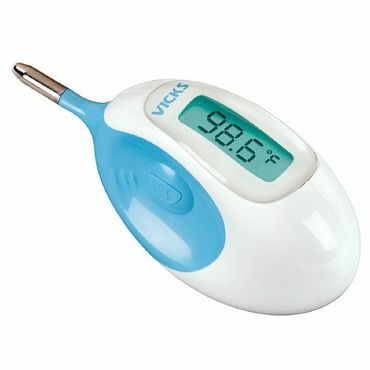 The Vicks V934 baby rectal thermometer is a smash hit with users, who love its soft, flexible, short tip. The egg-shaped base of the thermometer fits comfortably in your hand and eliminates any risk of accidentally inserting the probe too far; most parents say their child hardly even notices it's there. This is the thermometer that users turn to when they're frustrated by inconsistencies from other models, and it's backed by an impressive lifetime guarantee. 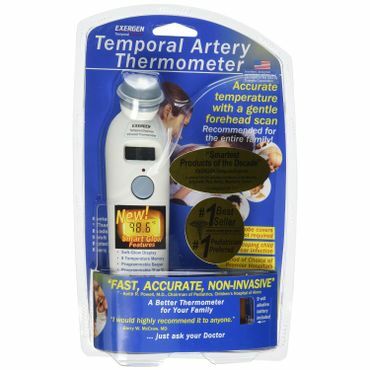 Like all temporal thermometers, the Exergen Temporal Artery Thermometer TAT-2000C requires a bit of a learning curve -- but once you've mastered the basic technique, it returns results so accurate and reliable that many medical experts buy the home version for themselves. Its accuracy has been verified in clinical studies, and you can set the display to beep and flash when a reading is complete, or turn this feature off to avoid waking a sleeping child. Today's digital thermometers are fast, easy to use and safer than traditional mercury thermometers. That said, most of them are made of cheap, mass-produced plastic and have a poor reputation for durability, so consider keeping an inexpensive spare on hand or planning to replace your thermometer frequently; the average lifespan seems to be about a year. We also found quite a few complaints about inaccurate readings. While some of those are no doubt due to poor construction, it's clear that many users aren't aware that a normal body temperature, taken orally, isn't strictly 98.6 degrees. It can vary between 97 and 99 degrees, and different temperature sites on the same person will yield slightly different readings. Oral thermometers are easy to use, familiar to most people, and accurate as long as you can hold still with the thermometer under your tongue until it generates an accurate reading -- sometimes 30 seconds or more. Most oral thermometers can also be used for taking axillary/underarm readings and rectal readings. Eating and drinking can alter the results of an oral temperature, so wait at least 15 minutes after meals or drinks to take your temperature. Ear thermometers use an infrared ray to measure the temperature inside your ear canal. They're a great choice for children six months or older, who haven't mastered holding an oral thermometer under their tongue or won't sit still for long. Also, your ear temperature won't be affected by variables such as eating, drinking, or mouth breathing, although lying with your ear on a pillow, having lots of ear wax, or using a hearing aid can all affect the readings. Although many parents are uncomfortable with the idea of using a rectal thermometer, they are still the gold standard in temperature measurement for infants and small children under three years of age. Although some stick thermometers can be used for rectal measurements, purpose-built rectal thermometers have a short, flexible probe for comfort and a bulb-shaped handle that keeps you from accidentally inserting the probe too far. When used correctly, temporal artery or forehead thermometers can be just as accurate as oral and rectal thermometers -- and they're far less invasive. They use an infrared ray to measure the temperature of an artery in your forehead and offer very quick readings, usually in 10 seconds or less. The downside is that most temporal thermometers come with a little bit of a learning curve, and if you don't get the ray targeted correctly, you won't get accurate results. "The Best Thermometer for Kids and Adults"
We found several summaries of expert, hands-on testing at Consumer Reports, Parenting, Wirecutter and The Night Light. These comparative reviews are especially useful when it comes to eliminating user error and determining which digital thermometers are most consistently accurate. That said, user reviews from retail sites like Amazon, Walmart and Target were just as important for learning how each digital thermometer functioned in real-world conditions, which included squirmy babies, fussy toddlers and sometimes recalcitrant adults too. Digital thermometers aren't the only home health tools that must be accurate, reliable and easy to use. We've also weighted heavily for real-world performance in our reports on blood glucose monitors and blood pressure monitors. It's hard to find fault with the simple, versatile design of an inexpensive digital thermometer. A good, basic digital thermometer can give years of accurate, reliable readings at very little cost. With that in mind, our best-reviewed digital thermometer is the Generation Guard Clinical Digital Thermometer (Est. $15). Although some users miss having a backlight on this thermometer, they love its quick, accurate readings (usually in 15 seconds or less, compared to 60 seconds for some of the competition) and appreciate the fully waterproof housing that lets you wash the entire thermometer if need be. This Generation Guard thermometer takes a single LR41 battery and can be used for oral, underarm and rectal readings, although it's best suited to oral readings. Underarm readings can be affected by skin temperature and, although the Generation Guard's soft, flexible tip and washability make it ideal for rectal readings, it lacks the broad base that dedicated rectal thermometers have to keep you from accidentally inserting them too far. The Generation Guard thermometer is accurate to 0.2 Fahrenheit or 0.1 Celsius, and it's easy to switch between Fahrenheit and Celsius by holding down the power button. Its features are simple but useful: it'll beep quietly (some say too quietly) to tell you when a reading is complete, then display the last reading taken when you turn it on. Finally, this Generation Guard thermometer is subject to a "no questions asked" 30-day money back guarantee, and their customer service department has developed an excellent reputation for proactively doing everything they can to ensure customer happiness. That's especially important for a product that, like all inexpensive stick thermometers, tends to draw a lot of user concerns about its accuracy and for sometimes arriving with dead or "almost dead" batteries. If all you want is a basic thermometer for occasional use or as a backup to your usual thermometer, consider the Vicks Comfort Flex Digital (Est. $20). 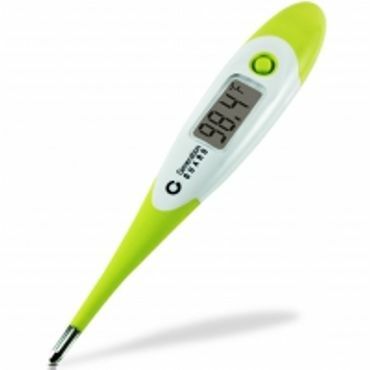 Users generally love this thermometer's features, which include a fully waterproof casing, recall of the last temperature taken, and a large, backlit display that changes color according to the temperature reading. 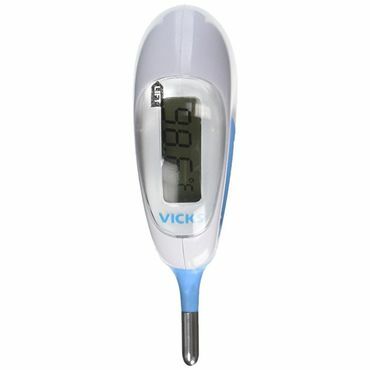 The same features garnered the Vicks V966 Comfort Flex a "best thermometer for kids and adults" pick from Wirecutter. The Vicks Comfort Flex is also fast, returning results in about eight seconds. However, it only received Fair ratings for its accuracy and repeatability in a test from Consumer Reports, and it draws enough user concerns about dead batteries and accuracy that we can't award it Best Reviewed status (although, to be fair, all digital thermometers receive a lot of those types of complaints). It is, however, a good bargain if you're looking for a simple thermometer for occasional use, and you can replace the CR1225 battery yourself. Although simple and functional digital thermometers are more accurate and widely available than ever, a few manufacturers are heading in the opposite direction, creating digital thermometers that sync with your smartphone to enable advanced functions. The best of these, the Kinsa Smart Stick (Est. $15) thermometer, is priced to be competitive with higher-end basic thermometers. It plugs into your mobile device's earphone jack -- with or without an optional extension cord -- and harnesses your smartphone's power to do most of the processing. The result is a light, durable device that can be used orally, under the arm or rectally, and returns results in about 10 seconds. Users are very happy with the Kinsa Smart Stick thermometer's accuracy, but it's the companion app that they really love. The free app lets you track symptoms, chart temperature readings over time, and note medications taken. You can even add photos to track conditions like a rash or sore throat. The biggest hit of all, though, is the "bubble game" that helps keep small children entertained and quiet as you take their temperature. They can count or pop the bubbles that appear on the screen. The Kinsa app also lets you store tracking information for multiple people, or submit your data anonymously to help crowdsource information about illnesses circulating in your area. All of the above are roundly praised by user reviewers, and Kinsa's proactive, helpful customer service department gets lots of kudos too. The only major complaint we see is that users sometimes struggle to get the thermometer synced to their phone, although we also note the usual complaints we see about all digital thermometers, mostly durability issues and questions as to temperature accuracy. There are, however, two catches to be aware of. One, the Kinsa Smart Stick has no display of its own, so you can only use it in conjunction with a smartphone that has the matching app. Two, along with the user concerns about accuracy that seem to accompany all digital stick thermometers, many note that this thermometer isn't compatible with every device, so check the manufacturer's compatibility list before you buy. In particular, if you own an iPhone 7 or later -- the models without a headphone jack -- you must use Apple's headphone-to-Lightning adapter to connect the Kinsa thermometer to your phone.